We’ve been putting some effort in recently to shift our major JVM-hosted MaxMSP projects to GitHub. Most of them started out hosted privately in CVS and built using Eclipse, and then migrated to hosting in Mercurial, with a different directory structure and a fair degree of pain in getting the various Ant scripts to work again. Moving everything to GitHub made sense, but that required another rearrangement of source directories and build paths, so it was obviously time to bite the bullet and use Maven to build everything instead. This decision has lowered the maintenance effort considerably. We’re workshopping, and gigging, at the M4_u (Max/MSP for Users) Convention, 13th to 14th of January, Phoenix Square, Leicester. 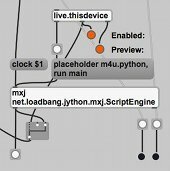 The workshop is pretty much going to be a repeat of that given at the Cycling ’74 Expo – building an algorithmic step sequencer and abstract display system using Clojure. The gig will be monome-based, probably with some pulse sequencer action. We recently did a bit of coding for Dreamhub: the Lysets Lyd chill-out gig at Vor Frue Kirke required twelve Percussa AudioCubes connected into an Ableton Live set, capable of sending MIDI data to Live (to trigger clips from the sensors) and of responding to MIDI (to transform automation controller messages into colour changes). Percussa’s bundled control software wasn’t up to the task at the time, being limited to four cubes at once and a rather laborious manual setup procedure, so we built a custom Max patcher using an external object by Thomas Grill and our Python machinery to deal with the configuration and state transitions required by the set.